Last month, after reading and hearing about all of the struggles that many dairy families are facing I thought to myself, “I should attempt to write something positive”. I’m no writer by any means, but someone smart told me once that personal growth comes from doing something outside of one’s comfort zone. As a dairy farmer myself I totally understand how some of these farm families are feeling in these tough times. There’s more at stake than “just” a business… It’s a life’s work. Most times numerous generations of life’s work… A farmer who takes over the family business from the previous generation is dedicated to not only making the previous generation proud, but also to provide that same opportunity for the next generation. Family farms come in all shapes and sizes, due to the location, surrounding environment and market needs. Dedication and commitment is something they all have in common. I previously suggested that one could support their local farm family by simply buying a gallon of milk or any other dairy product. Some folks ran right out and did just that… for their family or even other families in need… how awesome is that! 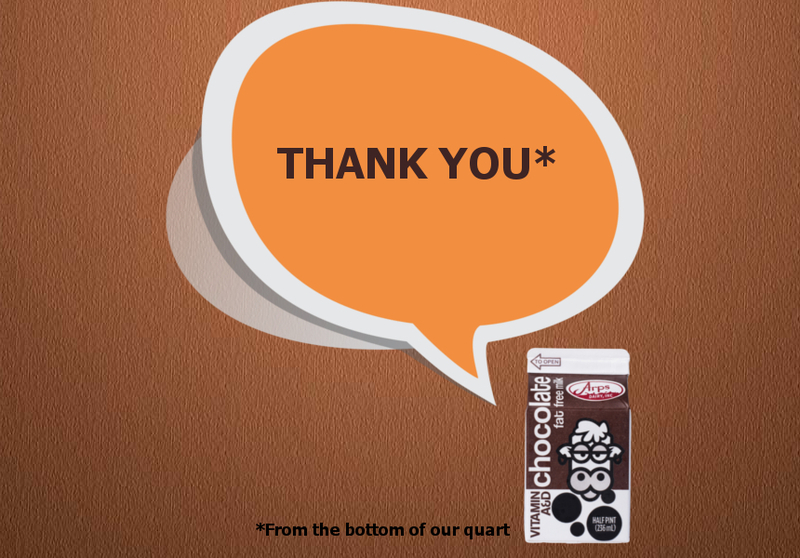 On behalf of other dairy farmers as well as Arps Dairy and all of its hardworking people I just wanted to say thanks. It is extremely humbling and rewarding to see a community supporting one another, from farm to fridge.